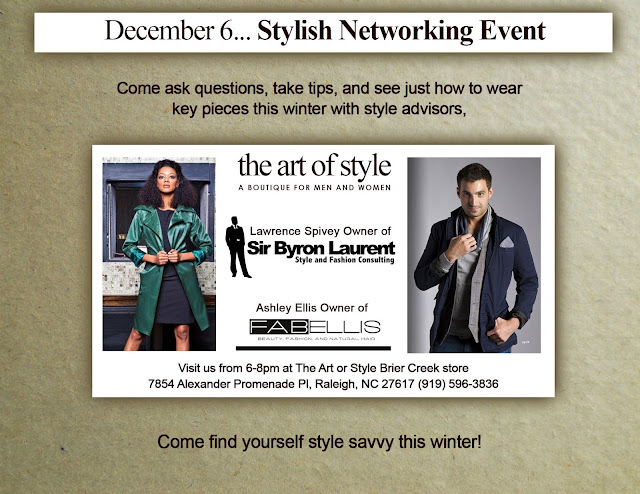 I'm sure you have seen my posts on Facebook and Twitter about the Stylish Networking event. I'm excited to be co-hosting this event with The Art of Style and Sir Byron Laurent Style and Fashion Consulting. I would love to see you all there! This FREE event will be held tomorrow, Dec. 6, from 6-8 p.m. There will also be refreshments and an awesome giveaway. Please let me know if you have any questions. Also, don't forget to enter my holiday giveaway! There are still a few days left. Enter here. Great event. Nice to meet you. Thank you for a very inspiring event. It was really great meeting you and I look forward to following your blog.